Like almost everyone else, I’ve installed Mac OS X 10.4 Tiger, and it’s a really very good upgrade to the operating system. The system-wide search will be really handy. 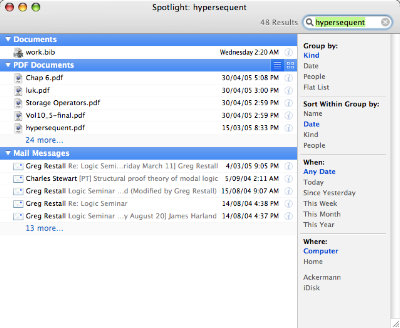 It’s indexed all of my documents (which includes a 2.3GB library of PDF files of other people’s papers), so being able to find the 29 papers that mention hypersequents (together with the 18 emails in my mail client) is just something special. I’m having even more fun, however, with organising my files using tagging. I’ll talk about that one later.